Goal: Build on the momentum and success of El Rancho Del Arte but creating a second and adjacent phase that would create a more ideal scale and continue bringing vibrancy to the downtown adjacent Mesa neighborhood. Situated just outside of Phoenix in the bustling arts city of Mesa, El Rancho Del Sol is CDP’s recent acquisition, demolition, and new construction project of a blighted apartment building and underutilized office building adjacent to CDP’s existing El Rancho del Arte community. Completed in the Fall of 2017 and designed for low-income families earning 40-60% of the area’s median income (AMI), El Rancho del Sol’s 47-units sits in two, 4-story buildings comprised of 2, 3, and 4-bedroom units. As a complement to El Rancho del Arte in both function and architectural character, El Rancho del Sol features onsite services and art installations that reflect the spirit and heart of the community. 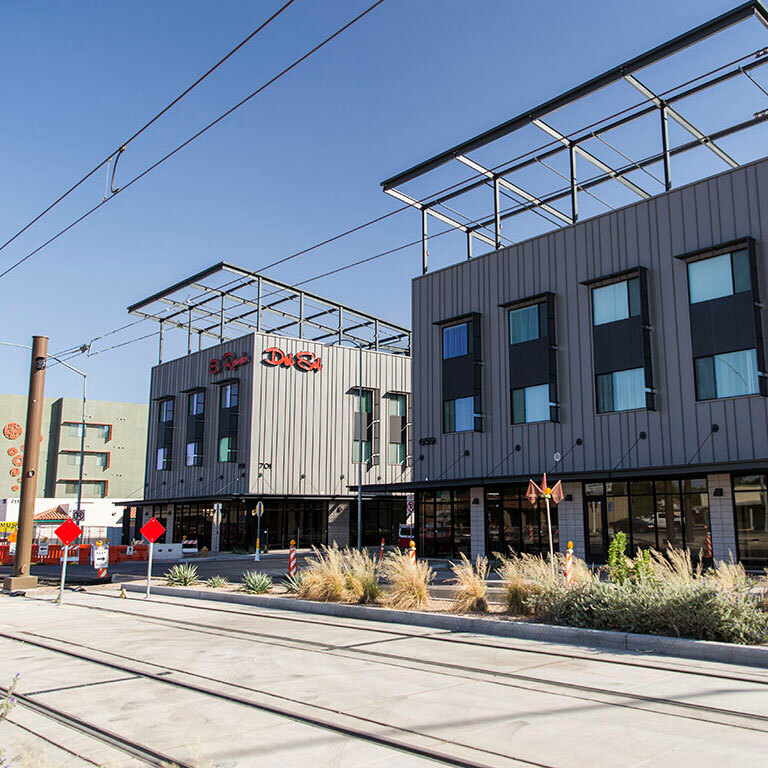 Common areas are central to the community, including a second-floor playground area, a movie theater, two exercise rooms, community and game room, and a fully equipped commercial kitchen operated by Local First Arizona. In addition, El Rancho del Sol offers outdoor patios and a rooftop BBQ and dining area so residents can take advantage of outdoor spaces with great views of the city. A crucial part of most CDP projects are the nonprofit organizations that partner with CDP to offer invaluable services for residents. At El Rancho del Sol, the Phoenix-based organization Local First Arizona hosts a business accelerator program onsite and utilizes the kitchen for businesses as well as weekly donation-based community dinners for residents and neighbors. 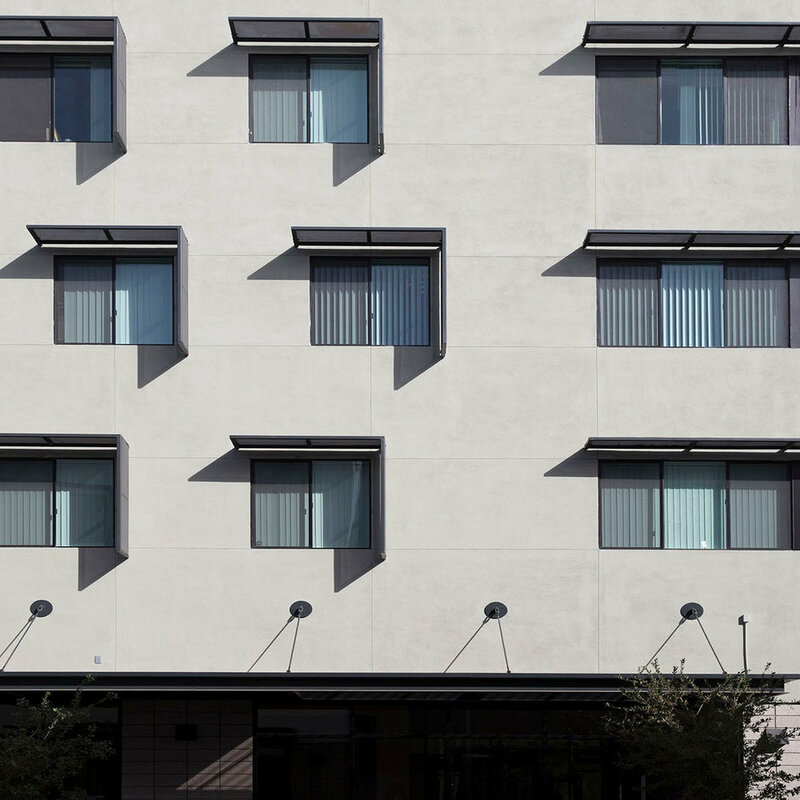 El Rancho del Sol was the second phase of our Mesa El Rancho community, born of a distinct vision for low-income family and artist housing that also provides enriching, culturally relevant experiences and supportive services. This project was a natural continuation of the first phase and similarly provided for the elimination of old obsolete, blighted buildings. Additionally, CDP was able to build upon the success of the first phase and create more scale and unique common area spaces that would allow synergy to be harnessed between the two adjacent sites. This project was also financed through 9% Low Income Housing Tax Credits under a similar competitive scoring protocol as the first phase. CDP utilized a design architect to help inform the initial concept design and then employed Perlman to handle the production and execution. To bring an entrepreneurial spirit to the El Rancho communities, Local First Arizona was engaged to lead programming and micro-entrepreneurship courses in the commercial kitchen and offices at El Rancho del Sol. Local First Arizona is a nonprofit organization that celebrates independent, locally owned businesses. They support, promote and advocate for a strong local business community and raise public awareness of the economic and cultural benefits provided by strong local economies. Local First created the El Rancho Kitchen program where residents and community members can go through their Dreambuilder and Fuerza Locale courses and once they graduate, can operate their food businesses in the El Rancho Kitchen space regularly. Additionally, Local First engages with the residents at del Sol through offering cooking classes in the kitchen and hosting donation-based community meals once per week at no or very little cost to residents. Bringing vibrancy and emphasizing the community’s cultures at El Rancho, Cultural Coalition operates onsite leading programming that focuses on the education and promotion of the indigenous cultures of the area. Cultural Coalition’s goal is to provide community engagement through unique cultural programs and to celebrate diverse cultures, serve families, provide cultural education and create new traditions. Cultural Coalition leads the after-school programming for kids living at the El Rancho properties, incorporating music, arts, dance, and provide homework help. Additionally, the organization has created a space for teenagers that promotes civic engagement. Garden Pool is a 501c(3) international public charity dedicated to the research and education of sustainable ways to grow food. The organization’s mission is to develop better ways to grow food and strive to help others do the same. Operating onsite in retail spaces, the organization continues to grow and develop more strategies like the “garden pool” invention to create a miniature, self-sufficient food-system. Additionally, Garden Pool offers resources and donations for the garden and manages a garden coordinator who teaches gardening and cooking classes to the after-school program and the adult residents, and works with the kitchen bringing extra harvests from the garden to use in community meals. The community’s very own onsite bike repair and donation shop is operated by WeCycle USA, a nonprofit organization that promotes independence, self-sufficiency and empowerment through the use of the bicycle. Taking bike donations from the community, WeCycle teaches kids of all ages employable mechanical skills while fixing their bikes and repairing other bikes to donate back to the community. WeCycle is a hub for not just the El Rancho communities, but serves the entire neighborhood, offering job training and a great, sustainable mode of transportation!